This software checked for updates to my program. When I went to update my Adobe Flash Player, it took me to a RUSSIAN site. I did not proceed, but went manually to Adobe to check…My Flash Player was up to date. Scared me big time, Uninstalled this program immediately with Revo. This is the best uninstaller I have ever tried and the version offered here is the latest, so I would highly recommend it. In my opinion it is the best, followed by iobit uninstaller and then advanced uninstaller. It also works as a software (not driver!) updater. The user is always in full control of what to uninstall or update. So far, this software rocks ! Definite 5 Star ! Simplicity at it’s best. Zero Learning Curve. Very intuitive. Easy & fast install. This uninstaller found scraps of software that Revo Uninstaller (the gold standard) did not find at all. I used to be a Revo guy. Now there’s a new Sheriff in town ! SO FAR, I Love this Software. When we install an application, the installer creates a directory in Program Files, creates shortcuts, make changes to the registry, add DLL files, and also install some system services. However, when uninstalling the applications, not all of these changes are removed, and the application leaves behind some of the files, settings, libraries, and services. This contributes to build up of junk in the system eventually causing performance degradation. 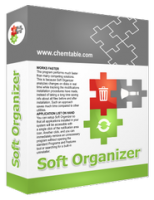 Soft Organizer is a software application that provides a solution to this problem. It is designed to help uninstall unwanted applications completely, and also keep track of the changes made to the system when a new application is installed. With an installer of size ~7MB, the installation process is simple and straightforward, taking no time at all to complete. After launching it for the first time, you can enter the license code in the window that opens up for license registration. Once done, you can access the main UI of the application, and it automatically scans and lists all the applications that you have installed on your PC. The application comes with a clean and intuitive UI, to make it easy-to-use and understand for all types of users, even the novices. The bigger section to the right is where you can see all your installed applications. These can be viewed as a list or large icons according to the users preference. You can sort the application by name, developer, date, size, rating, and tracing status. The section to the left let’s you install an application with tracing, remove application leftovers, find updates for all applications, and give you ratings of which apps have been uninstalled the most. On the top right, there is a search bar and a drop down menu to access different options and tweaks. The application comes with just the right amount of tools that are needed, and are actually useful. The search bar at the top, let’s you search quickly from hundreds of application that are present on your PC. Alongwith scanning for leftovers of the applications currently being uninstalled, this application can also scan and remove the junk of applications that have been uninstalled before you started using this tool. You can also remove Windows 8 and Windows 10 applications that have been installed from the Windows Store. Tracked installation keeps track of all the changes an installer makes to the system, this comes useful when you no longer need the application and try to remove it. The application knows what to delete and what changes to reverse. The application also gives all the installed applications a rating, that helps users to decide whether to remove it or not, and the built-in updater helps you update all the installed applications. Moreover, the application creates automatic restore points just in case something goes wrong. You can also batch uninstall multiple applications and group them in various ways. Sorting parameter according to application use is missing. Having this option let’s users easily remove the applications that they do not use frequently. No option to remove browser tool bars and plugins. Soft Organizer is a powerful, user-friendly application that let’s you remove unwanted applications from your system. Features like traced installations, and built-in application updater really make it stand up against other similar applications. The application runs smoothly without any lags or crashes, and uses low system resources. 1.) The interface is extremely user friendly, uncluttered, and simple to use even for a novice. 2.) I have many programs installed. Soft Organizer loads faster then any other from the shortcut. 3.) When SO was first installed, remnants were listed from earlier uninstalls that I never would have noticed. SO uninstalled these for me. 4. )Several programs that I did not realize were installed on my system were recognized by SO, enabling me to uninstall them. 5.) The program offers a find updates option for installed programs. 6.) A two computer lifetime option for this Giveaway is extremely welcome and generous. I’ve used various versions of this software over the last few years and have kept it because it is reliable and very thorough. Invariably it removes all traces of software, even from some of the more notoriously difficult to remove software from certain security vendors. It doesn’t have a lot of tweaks available in the settings before starting the removal process, after searching you get a choice of what you remove. Its fairly simple and safe to use, you’re unlikely to remove anything that you shouldn’t have done. It can seem like it is taking its time with some larger software that has loads of registry entries, but I’m happy that it does take its time doing this. I’ve never had a problem from using SoftOrganizer. It has always done what it says it will, and no more. I trust it. Excellent software and maybe the best uninstaller I ever tried.Simple,understandable GUI.You can install new program by opening SO,or just drag exe file to SO icon.You can trace all changes made by installing new software,even if installation is not traced (installed) with SO,You can see traces of any program on your machine.After opening SO there is a list of all applications You have,together with developers name,date of installation,application websites and very useful Uninstalled By info-the percentage of users who removed the application shortly after installation,which is basically like a review of quality for every application and it is pretty accurate.For every application You have,it’s easy to check all traces.Find the application on the list(if You have tons of programs there is search field-upper right),click on it and You can see the number of Registry and Disk items traces.Right of those numbers click on View all traces to open new window with tree organized Registry and File system traces.If an update is detected for some application and Soft Organizer can provide a verified download link for the update, the application will be highlighted in the list with a check mark.I compared SO with few other uninstallers and when You uninstall something with SO,there are not junk left behind(particularly if installation were traced),even if it isn’t,SO will perform search for leftovers,and almost always manage to find it.There is also the Undoing changes Center with list of changes to the system made by SO,which you can undo if necessary.I have full version with free updates (for 2 computers) and support. Support is excellent.I had one issue(caused by Toolwiz Timefreeze),and they helped me to solve it.You don’t need to wait longer than few hours for replay,and they are willing to help You and even to teach You some things,which are not related with their product. This is a fantastic uninstaller tool and am loving it! In changing its name to Soft Organizer, the former Full Uninstall software seems to have taken a rather low tone approach. Since I had used Full Uninstall before, when I came across this new version with a new name, I was curious to find out if the toning down of the name was a move to concentrate and introduce comprehensive functionalities. This is what I found. Right from the installation, Soft Organizer seemed promising. Before choosing to finish the installation process, I had an option to deselect the Enable functions requiring data transfer option. Such functions involve sending information regarding leftover files and registry keys of uninstalled applications to Soft Organizer’s servers and checking details of installed applications. Otherwise, the installation process was a breeze and only took a couple of minutes. With this option, I was able to install applications via Soft Organizer’s Run Installer option or directly using the apps’ installation files. After the installation, Soft Organizer traced and analyzed the changes made on my system. The importance of the traced changes was that Soft Organizer was able to completely uninstall the applications I did not want without leaving any traces. The idea of regularly checking updates for different applications installed on my system is not always welcome. Thankfully, Soft Organizer provided me with an option to automatically check for new updates for all applications. A list of apps with updates was shown with the option to download the updates. Clicking on the download update button takes you to the app’s developer official page, which makes the updates more genuine. You can also export version details of all installed applications to a text file for reporting purposes. Soft Organizer provides a simple way to know details about the applications currently installed on your system. Under Settings and Commands, a single click on the Export the list of applications was enough to generate a well-formatted html file containing the name, developer and installation date of my installed apps. The list of applications shown by this option is based on information from Soft Organizer’s servers. The percentages shown represent the number of users who uninstalled specific applications shortly after installing them. Listed applications depended on my installed apps and I was able to do more research on why people uninstalled applications that had the highest percentages. While using Soft Organizer, I did not find an option to show or list installed application based on the space they occupied on my drive. Such an option would have been helpful especially when running out disk space to know which software to uninstall. If you have stubborn registry files of an application you previously uninstalled, Soft Organizer will be a worthy option for removing the same. Its install application with tracing feature is a plus and it will also help you avoid future traces of uninstalled programs. Excellent utility, you won´t be disappointed.